Rev. Nathan and Sarah Esala served and worked on the Likɔɔnl (or Komba) Bible project in Ghana, West Africa. Nathan’s role as a translation advisor presented new (to him) experiences such as: developing partnerships with the Komba church and community leaders, analyzing/documenting the linguistics of the language, checking translated drafts for quality, assisting in final New Testament revisions for publication, driving a hard bargain, and controlling water run-off. Currently, Nathan is serving as the Translation Coordinator for LBT. He desires to discover and facilitate excellent practices in Bible translation and missiology for Lutheran Bible Translators with our global partners. To help accomplish that goal, Nathan is enrolled as a Ph.D. student at the University of KwaZulu-Natal in South Africa. Sarah interweaves her experience and skills by serving in member care, coming alongside missionaries and staff to help where they are feeling stretched or frayed. 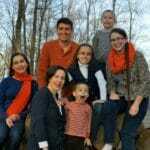 Nathan and Sarah have five fabulous children: Karissa, Annaka, Aili, Isaac, and Eliot. LBT is seeking Lutherans to serve overseas through the ministry of Bible translation and Scripture Engagement. If you feel that God may be leading you towards missions or if you wish to make translation donations for a missionary, LBT may have a place for you.